26/9/17 – Erroneously claimed that the potion stoppers had a different tactile profile depending on type – they don’t, as noted by this comment on BGG. I’ve removed that text. 26/9/17 – Added some emphasis in the colour blindness section regarding physical marble variability – that was mentioned elsewhere, but it’s relevant in that section too. Potion Explosion is as much a toy as it is a game – that big marble dispenser is not just a triviality at centre of the table. A lot of the thrill of play comes from the tactility and fun of throwing marbles into the thing and then picking them out in every greater handfuls. We gave it three and a half stars in our review because it’s a decent game with an excellent gimmick. How accessible is that gimmick likely to be though? You can trust me to report on this – I got an O in my Potions O.W.L. back in the day. I don’t know. I don’t know. I just don’t know. I think you can tell the difference between yellow and red, but if you look at the bottom column of the second slider there are certainly edge cases as the light shifts. You also have to take into account variance in the marbles themselves. They’re not uniform. 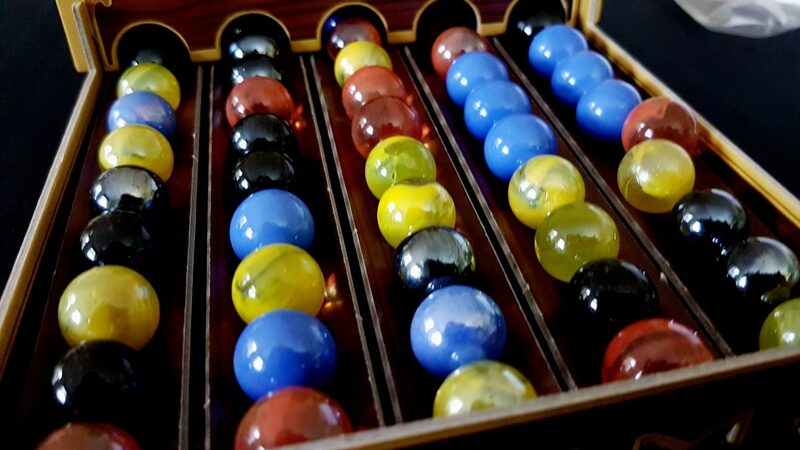 The second, third and fourth marbles in that slider are respectively yellow, red and red. While the yellow and red ones are noticeably contrasted, the middle one is more of a judgement call. I think it’s enough to consider this a problem, but I appreciate here opinions will vary. Do you think you could play like this? The contrast between the colours is more marked on the potion tokens – the red looks more like brown here and a different texturing is used on the blue ingredient bars. 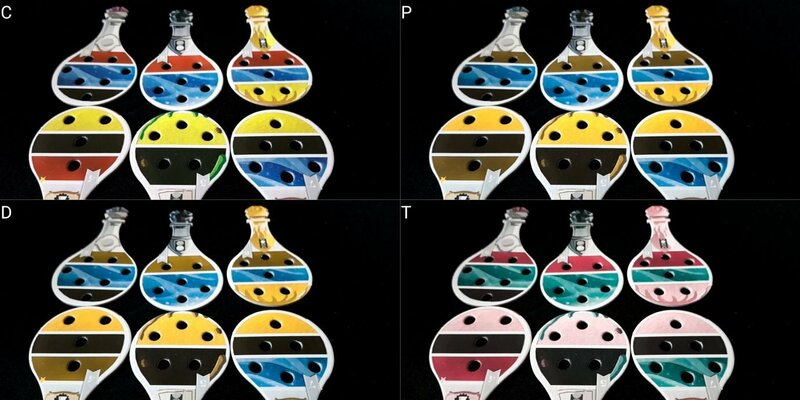 Different potions are identified by stopper style and a symbol that is prominently marked on the front. These exhibit palette overlaps, but no information is lost as a result because of the different stylistic elements. I’m torn here. I suspect the game is playable in optimal lighting conditions but I also suspect it’s going to be difficult where the illumination is not good, or cannot be controlled. Colour matching is such an important part of the game too that if a single marble presents itself in a different shade, it’s possible to misjudge an entire chain of explosions because of it. I’m inclined to say that we tentatively recommend Potion Explosion. 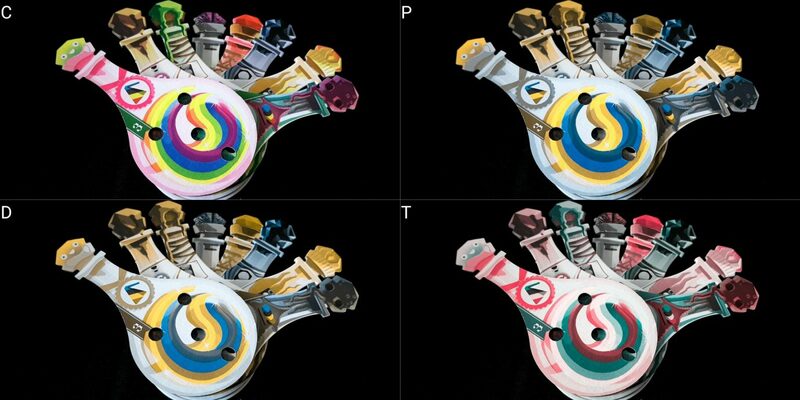 The colours, after all, are possible to differentiate. It’s just not as clear a differentiation as I would want to see. I’d be interested to hear though from colour blind players with more embodied experience of playing it – I will adjust this recommendation accordingly if anyone posts a comment. 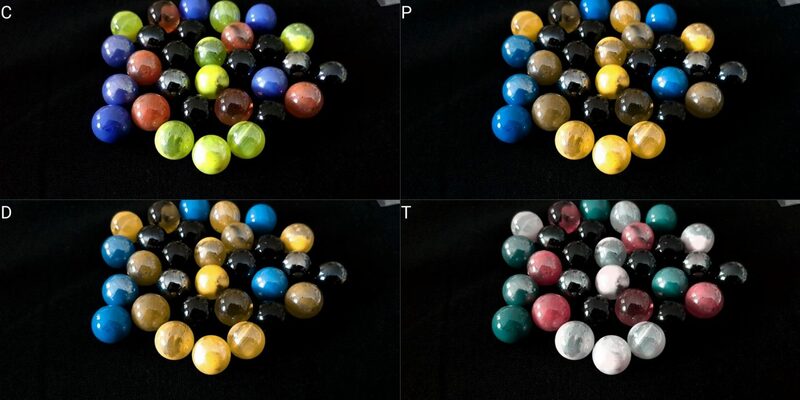 The different marbles, of course, have no tactile identifiers to distinguish them – since marbles are your key element of game state, we’d suggest the game is all but totally inaccessible to those for whom total blindness must be considered. There’s a lot of tactility to working out game state here once you have a potion in front of you – holes indicate the number of marbles needed, and the presence of marbles themselves is a tactile indicator (albeit one that is subject to being mistakenly rolled away). If you have some degree of colour differentiation you can almost certainly make out what ingredients are needed. If not, compensatory strategies are possible. The dispenser here is the key source of inaccessibility. On one hand, it does make setup a breeze because you just pour the marbles into it and then flick the ones that get stuck into an adjacent hole. This turns what is often a visually inaccessible exercise in many games into a task that is over in seconds. However, you can’t get around the fact that identifying potential explosions is a visual exercise. More than that, it’s one that requires mental branches to ascertain the impact of cascading explosions. We looked at one of those in the review. There is a mitigating factor though. You’re only assessing an individual slider for potential explosions – they only propagate vertically, not horizontally. That permits a player to exhaustively examine each possible selection because the problem space is only one dimensional. This is made a little more complex because of the role that potions and the aid of the professor will play in permitting other options. I think it’s likely manageable – perhaps with an associated support tool like a spreadsheet or notepad. It’s not going to be great for game flow, but it’s a technical possibility. It becomes more difficult if you’re playing aggressively and trying to cut off the routes an opponent has to their ingredients – all the tactile clues disappear when you’re considering someone else’s game context. You can inquire about it though without leaking much game information – after all, what the dispenser looks like after you’re done is an unknown factor, and it’s not like anyone can necessarily utilize your query to screw you over. Most of the game state is played entirely open. We’re prepared again to offer a tentative recommendation here – your mileage will vary but given how the game is prone to deep, intense cogitation anyway it doesn’t necessarily have a lot of impact for that to be focused on an external representation rather than the dispenser itself. However, that’s always going to be a sub-optimal solution. Being able to set up chains of explosions, or even see how they’re going to be triggered, is an intensely costly cognitive process. Identifying one single explosion is simple enough but ideally you want to be able to identify current and future opportunities for cascades. Essentially that requires parsing the game state for colours that will be adjacent if a marble is removed, and then the colours that will be adjacent when those colours are removed, and so on. It means holding several varying copies of the game state in your head at once for every marble you are considering. Some of this is done intuitively as a result of visual pattern matching, but some of it needs more consideration. This is complicated too by the fact your collected potions will let you nudge that game state in different ways if you want – you can engineer the circumstances of your own victory. Similarly with the assistance from the professor – you can remove a single marble at the cost of two victory points, and that might be the difference between a disappointing turn and a satisfying cascade. Multiply all of this cost by however many players are present if you want to play aggressively. While luck is definitely a factor in play it’s not the dominant one – someone that can mentally parse the logistical puzzle at the core of the game is going to do much better than someone that can’t. Now, I don’t want to over-egg this – you don’t need to find the optimal marble to make good progress towards brewing your potions. You just need to pick a good one – picking up a dozen marbles isn’t much good if you end up discarding ten of them. The right explosion is not necessarily the biggest one. That in itself opens up a new consideration – ‘what is the difference between what I need and what this marble will get me if I select it?’. It’s entirely possible for anyone, regardless of cognitive accessibility considerations, to stare at the dispenser in mute silence for minutes without coming to a clear conclusion. There’s no reading required of play, because everything is entirely symbolic. However, the potion symbols aren’t necessarily great for permitting easy recall of what they’re supposed to do. They’re representational, rather than descriptive. 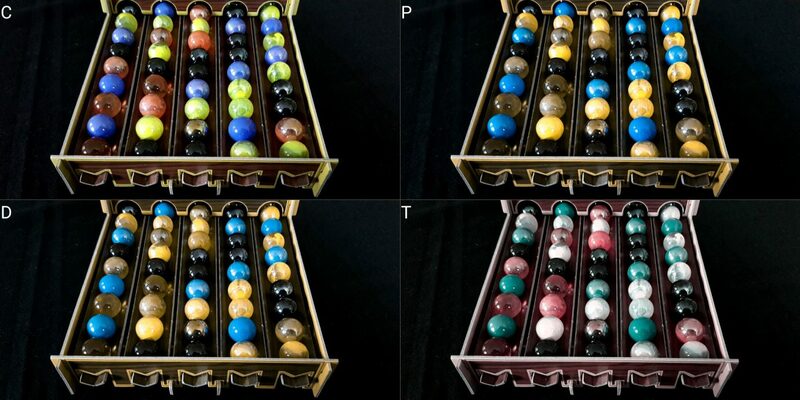 There are some really nice features here though – the slots left for marbles in each of the potions permits the game to work on implicit rather than explicit numeracy, and the colour matching of marbles to slots means that it greatly reduces the cognitive burden of what is essentially an economic allocation. Nobody needs to be able to count, they just need to fill the holes with the right colours. With a different component design the resource management would be a cognitive concern. Here, it’s handled beautifully. I really, really like this even if the cost of it is a million little didcots littering every inch of my kitchen floor. Similarly great is the fact the rules are so instantly tractable, and how the act of selection has a one to one fidelity. It’s not a case of ‘pick a cube, now that cube represents a worker you can spend to get a wheat’. It’s ‘pick a marble. That marble is the marble you need’. It reduces the distance of abstract association to its smallest possible value. It’s like the difference between using a computer mouse and a touchscreen – the mouse needs you to learn how to adapt your movement to their screen representation. The touchscreen is a more instantly intuitive interaction medium. Another really nice feature is that the dispenser is just fun to manipulate, and in the end if you’re just looking to have fun with some friends you don’t lose all that much by eliminating the competitive element. 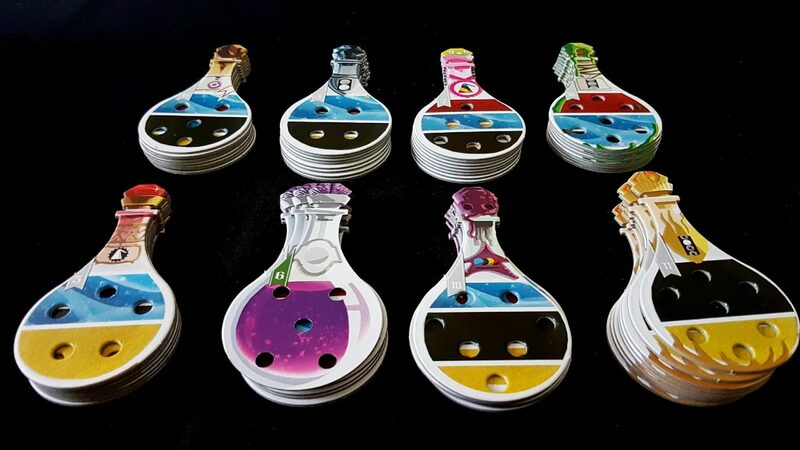 Potion Explosion scaffolds well – you can select the simplest potions (and perhaps only a smaller number of them), you can remove the cost from the professor, you can play collaboratively for maximum score. So much of the game is in the satisfying selection of marbles that you can structure a less cognitively costly activity around it. It’s actually fun to see other people make impressive chains of explosions. If you wanted to play it as a homebrew variant with trading and collective score-keeping I think you’d still enjoy the experience and be able to share it with people exhibiting a very wide range of cognitive accessibility profiles. Our recommendation here is multivariate. Let’s break it down into use-cases. If you want a game that a multi-ability group can play correctly and have fun, Potion Explosion probably isn’t it. The cognitive challenge in selecting good moves is considerable and it needs people to be on an approximately equal mental footing. If you want a game that players with roughly the same cognitive ability can play together, Potion Explosion is likely suitable. The cognitive challenge here is only an issue if players have significantly varied capabilities. It’s otherwise simply satisfying to play with the dispenser and brew potions. If you want a game that you can house-rule that a multi-ability group can modify and play together, Potion Explosion is almost certainly a game you should consider. 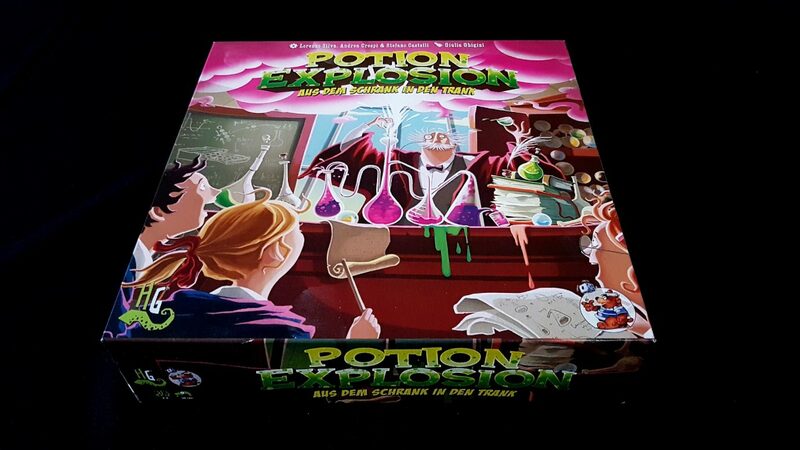 Overall then we recommend Potion Explosion in this category provided you don’t mind ensuring relatively equal cognitive abilities are represented around the table, or that you’re happy to house-rule it into something collaborative. Otherwise, we’d advise you consider other games more appropriate for your specific usage scenario. There’s only one element of direct player versus player interaction, and that’s through the Elixir of Blind Love. While it’s possible that might be frustrating, especially if a lot of people are doing it, you can only steal ingredients from an opponent’s pool. If those ingredients were directly useful they would have been thrown into potions where they couldn’t have been stolen. It’s at worst annoying, even if it does permit players to gang up on someone else. The cost for the target is relatively low, and if you want to avoid it you simply leave that potion out of your setup. You can choose which six you include for a game – that doesn’t have to be one of them. A more persistent issue is in the way the game permits for runaway leaders, and thus significant score disparities. Success breeds success in Potion Explosion because it leads to brewing more potions, which permits for more ingredients to be gathered, which allows for more potions, which generates more points. The nature of play means that sometimes you’ll see the absolute perfect combination of ingredients slide out of the secret compartment of the dispenser only to watch your opponent pull of a fantastic chain of explosions that you were never permitted the opportunity to exploit. That’s the nature of the luck based distribution of marbles though, and it’s as likely to happen in your favour as it is in anyone else’s. These are minor quibbles though – Potion Explosion is really a very easy going game of pattern matching. It’s unlikely to present many opportunities outside the norm to upset people. We’ll offer a strong recommendation here. Play is certainly possible via verbalisation, although the game doesn’t do anything specific to enable it. You can come up with a convention for numbering though that permits unambiguous referencing – ‘take the blue marble that is five up on slider two’, for example. Everything else is handled through implementing the set mechanics of the cascading marbles. There’s a reason I made specific notice in the review of how much fun it was to play with the marbles. It’s because it’s so much fun to play with the marbles. At its core, Potion Explosion is a simple but competent matching game. If you wanted that, then there are all kind of digital games that do it so much better and in a fully accessible way. 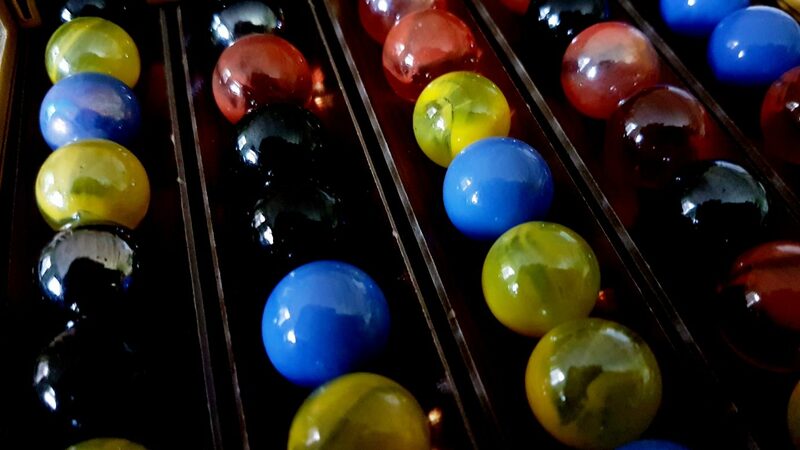 Potion Explosion is special because you’re playing with marbles. It’s a tactile experience, whether it’s throwing handfuls of them into the dispenser (which is enough to make you grin with glee) or carefully slipping one out and then happily scooping up those that explode. It’s not an insignificant thing to lose that element. If physical impairments are less severe than would require verbalisation, it’s still not a particularly positive story. 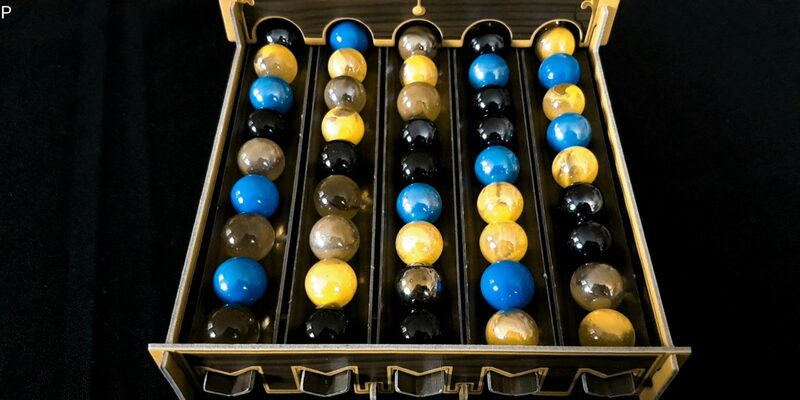 It’s easy to nudge marbles out of position because the sliders are not very deep. If you do that, you’ll have a devil of a job putting the game back the way you found it. As you try to push marbles back up a slider they’ll often fall off into the adjacent runners, by which time you may as well just give up. You can adopt a convention that any marbles dislodged in this way are just discarded into the back of the dispenser, but that may not be particularly satisfying if it screws someone up in the process. The dispenser too is somewhat flimsy – you can glue the pieces in place, which is fine, but when it’s loaded with marbles it’s not easy to move without upsetting things. If you haven’t glued it, simply pulling it towards you might result in you dislodging the front panel which would then cause the marbles to spill out everywhere. The result is that its position has an accessibility implication. Either it stays somewhere central where everyone can reach it, which might not be optimal if one or more players has a physical impairment. Or perhaps it stays where one person can reach it and everyone has to get up to make their selection. That also may not be optimal if a physically impaired player can’t move out of someone’s way to make it easier to access. When you distribute marbles into the dispenser, a certain degree of care is needed. In the video I posted in the review for example, the combination of pouring from a plastic bag and filming with one hand meant that one went bouncing happily off the side of the table and under a cupboard. That’s a problem with a lot of the physicality in Potion Explosion – in the end, marbles won’t stay put unless you’re very careful. You might have a handful of a dozen of these to deal with, and if you place them down they might well roll – some containers to hold them will be useful here. When you put them in the potions they sit quite happily but they’re easily dislodged. A hand spasm, or someone knocking a table, might send them rolling away and force everyone to go scampering after them. There is a small bag of replacement marbles provided, which is a nice touch, but the simple fact this is included is a fair hint that rogue marble motion is a thing to take into account. We don’t recommend Potion Explosion in this category. One of the students on the box is a girl, but she’s flanked by two boys and facing a male professor. You might be willing to offer a little leniency here though since almost everything about Potion Explosion is designed to evoke the spirit of Harry Potter. You could think of the students on the box as pound-shop versions of Ron, Hermione and Harry listening to the knock-off Dumbledore at the desk. The manual is written in second person perspective, and this is very effective at eliminating default assumptions of masculinity. The gender balance then isn’t terrible, but it could also be better. Potion Explosion has an RRP of approximately £40, and it supports a maximum of four players at a time. However, you really can’t complain at the components you get – a big bag of heavy, chunky marbles along with a massive number of potion tokens and the Ikea potion dispenser that sits in the centre of it all. It’s as much an ornament as it is a game, and as such you’re paying at least in part for what is likely to be the most visually distinctive game in your collection. We’ll recommend Potion Explosion in this category. There’s no required reading level for play, and no formal need for communication except to occasionally say ‘whee’ when you throw a handful of marbles into the back of the dispenser. We strongly recommend Potion Explosion in this category. The cost of interpreting the game state is going to be a serious issue when dealing with an intersection of visual and cognitive accessibility – when the marbles can’t be assessed visually it’s necessary to hold a more detailed model of the game in memory than would otherwise be required. That would be enough to negate our recommendations, tentative as they may be, in these categories. Similarly, an intersection of visual impairment and colour blindness would nudge these out of being tentative recommendations. I’m already somewhat dubious about the colour blindness issue but even that is contingent on players having otherwise clear sight. If that were not the case, the game would likely be inaccessible. A communicative impairment paired with a physical impairment would render verbalisation more difficult to enact, and this would have a corresponding impact on the quality of the game experience. We noted above that Potion Explosion is playable with verbalisation but you lose a lot of the fun that comes with manipulating the game. As such, while we don’t recommend Potion Explosion in the physical category anyway, we’d certainly understand if someone wanted to ignore this and give it a go. This intersection would put substantial additional barriers in the way. There might be quite a bit of downtime between turns, especially with the higher player counts. There’s a lot to consider before you pick your marble, and it’s possible for people to stare for quite some time before working out what to do. This creates a pair of complicating factors. The first is that when dealing with attention issues stemmed from the intersection of emotional or cognitive impairments it might be difficult to keep focused on play. The other is that a certain degree of impatience is to be expected if people are taking too long to make their moves, and this might apply some pressure likely to exacerbate emotional considerations. Nobody likes to feel as if they’re being rushed, after all. If not as if people can necessarily be planning their moves while you take yours – the state of the dispenser as it arrives in their turn may bear little resemblance to what they hoped. Potion Explosion isn’t an especially long game and you can scale the time length up and down through adding and removing available skill tokens. 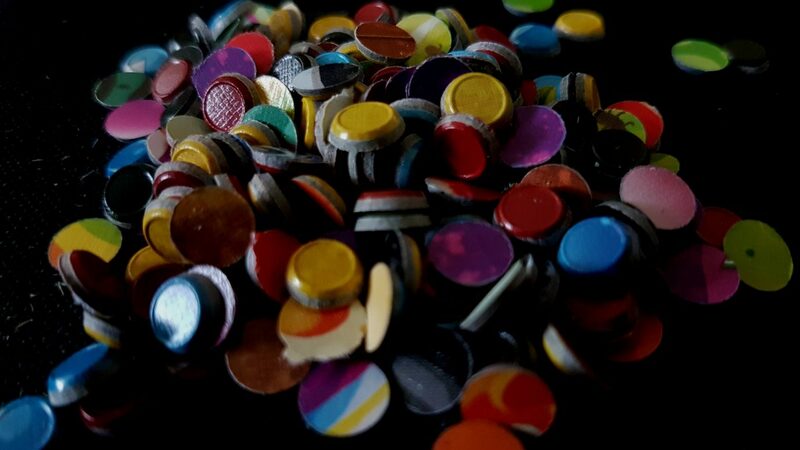 It’s also a game that lends itself well to players dropping out – all that need be done is to distribute their skill tokens to the bank and their marbles to the dispenser. While they may have taken potions out of play, there are enough of these that it’s unlikely to be an issue. It’s not possible for someone to simply deal themselves back in after this, but the game usually doesn’t last longer than an hour at larger counts. We’ve seen better, and we’ve seen worse. Given how peculiarly unique Potion Explosion is in terms of its interaction profile it’s only to be expected that it wouldn’t generate a wholeheartedly glowing accessibility report. Some of the tentative grades here are especially tentative. I am not at all convinced about the colour-blindness impact, although the publishers say they have tested it with colour-blind players and they found it workable. I’d be keen to hear observations from colour-blind readers that have tried it themselves. There is so much variance in this particular case with regards to the physical marbles, the severity of colour blindness, and the environmental impact that I don’t feel confident in saying much either way. Potion Explosion adds yet another data point to Meeple Like Us, and like many games it broadens the problem space rather than shrinks it. We haven’t looked at a marble based game before, and now we see a whole pile of things that are unique to this rather distinct gameplay interface. We’ve published over eighty of these teardowns now and we’re still finding games that are utterly unique. We gave Potion Explosion three and a half stars in our review – it’s a lot of fun, with a great deal of charm and a hook that makes it unlike anything else you’ll have on your shelves. It’s not quite Potions at Hogwarts, but for those of you that never got an acceptance letter you might find it’s a reasonable alternative. For those of us that did – it’s really nothing like it. It’s good enough for the muggles I suppose, but we know better. See you all at the reunion in Hogsmeade!